Casa das Flores «AL» is a single storey villa and, we understand, the former 'show house' for this quiet residential development. Set in a third of an acre plot overlooking the first green of the golf course at Vale de Milho; approximately a mile and a half east of the popular former fishing village of Carvoeiro. Tennis courts, shops, a number of restaurants and Centianes beach are all within easy walking-distance of the villa. Riding, sailing, diving, water sports and deep-sea fishing are also available within short distances. 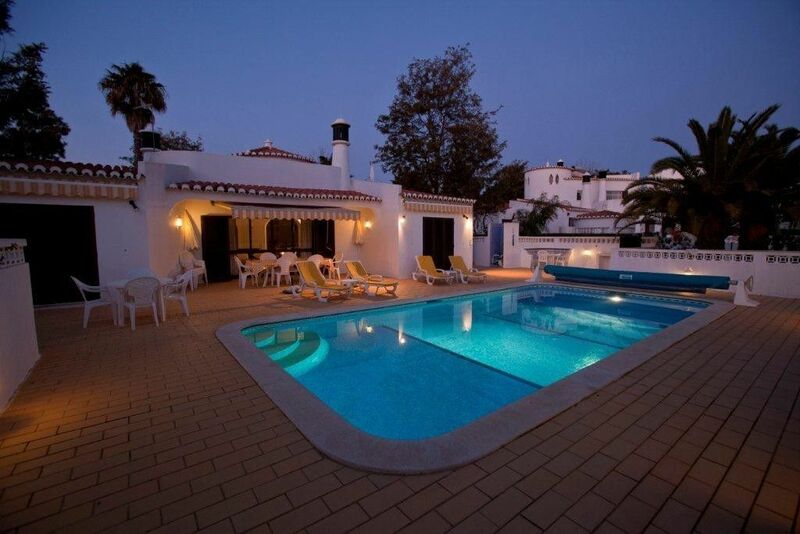 The house is fully compliant with the Portuguese LICENSING LAWS for holiday rental properties. Prices INCLUDE POOL HEATING and unlimited, secure WiFi. Please be aware that we have a strict policy of NO SMOKING in the house and anticipate that guests will respect what is our only 'house rule'. Carvoeiro: Is a delightful former fishing village just a short drive, or twenty-or-so minute walk, from the villa. The town accommodates most holiday needs with its tourist information centre, bars, banks, pharmacy, moped, car and bicycle rental outlets and a huge variety of restaurants. The central square leads directly on to the beach backed by sandstone cliffs so typical of the Algarve. The coast road leads east and west from the square to a number of secluded coves. What to do? : Boat trips can be taken from the beaches at Carvoeiro and Benagil to less accessible beaches, coves and caves along the coast. Horse riding, Snorkelling, Tennis and water sports are all available nearby. There are also two water parks ('Slide and Splash' is our preference) and ‘Zoomarine’, a marine theme park, all within a short drive. The tranquillity of the mountains, the pine forests of Monchique and the ancient Moorish walled town of Silves, the latter only 15 kilometres away, make pleasant inland excursions. Alternative, but equally enjoyable, excursions can be made to the old port of Portimao and to Lagos. Owner contact:- email: gareth@thecades.plus.com, 📱 +44 (0) 7802 863384, ☎ +44 (0) 1425 619505 My wife and I first visited the Algarve in 1980 with our (then) young family. Over the next 20+ years we revisited the area on several occasions with our growing family and were always pleasantly surprised by how welcoming the Portuguese were - and indeed, still are! In 2002 we bought Casa das Flores and now have the very real pleasure of seeing our own grandchildren enjoying family holidays in the area we've grown to love. Over the years the area has, of course, changed a good deal but still retains a real charm and if you enjoy eating out you'll be spoiled for choice with the fish dishes being particularly good. Casa das Flores is an ideal family holiday home and particularly well suited to two families sharing. We try to provide a good service and maintain good relations with our guests and always listen to and take seriously their comments and suggestions. As you'll probably have seen, we have well over fifty "5 star" reviews on this site and work hard to maintain our standards. The house is adjacent to the first green of the Vale de Milho golf course and we never cease to be amazed by how quiet and peaceful the whole of the Vale de Milho area is – even in the height of the season the inevitable “family-fun” noise doesn’t feel intrusive and the peaceful ambiance is still there. We try to maintain the house to a high standard. The kitchen and all the bathrooms have been refitted in recent years and the pool has been retiled. We also have a rolling programme of replacement and renewal to help ensure that the soft furnishings are up to scratch. Our aim is to be as flexible and accommodating as possible and to avoid having formal "Terms and Conditions". However, we recognise that our guests will wish to know what money is due when and understand the position if they are forced to cancel a booking. We ask for a holding deposit of £100 at the time of booking and that this be made up to 20% of the total rent six months prior to the beginning of your holiday. The remaining 80% is then due just four weeks before the start of your holiday. In the expectation that our guests will treat our house and furnishings with consideration, we do not ask for any “security” or “breakage” deposit. In the unfortunate event of your having to cancel a booking, we will make all reasonable efforts to re-let the period and, assuming we are successful in this, we will reimburse all the money you have paid. If we manage to re-let only part of the cancelled period, we will reimburse a pro rata share of the money you have paid. In the (hopefully unlikely) event that we are unable to re-let any of the period, all money paid would be forfeited. All the bathrooms were completely refitted in 2007. Vale de Milho Club House at 300m. A half set of 'Wilson' clubs is available at the house. Please note that we have a strict policy of NO-SMOKING in the villa. A car, whilst not strictly necessary, will undoubtedly add to the enjoyment of your holiday. The villa has a monitored burglar alarm to help improve your safety and security. We booked direct with the owners: gareth@thecades.plus.com The process was easy and communication was excellent. - While we didn’t use them (not being gofers) it was impressive to find we had use of a half-set of golf clubs too. The location is great, the villa is on a quiet golf development on the edge of Carvoeiro, walking distance to the nearest beach and a number of decent restaurants. A small store at Rocha Brava is nearby with larger supermarkets being a few minutes’ drive away. Gareth was also extremely helpful in assisting us in resolving an issue with Europcar after our visit going above and beyond anything we could have expected. In summary, Casa das Flores is a great villa that exceeded our expectations. Thank you for your very kind review of Casa das Flores. We’re delighted that you had a good time and the house exceeded your expectations! One minor point, we only heat the pool to about 27°C so anything higher is courtesy of the sun and the solar pool cover! A great holiday in a great villa! The weather was fantastic and when it got too warm the sparklingly clean swimming pool was an excellent place to cool down!! As others have said, the house is exceptionally well equipped with everything one could wish for in a holiday home and is kept spotlessly clean by the maids. The owners are a delight to deal with and answer every query - however minor – thoroughly and with patience and good humour! Communication with the owners was excellent and all my questions were promptly and patiently answered before booking and after. The villa itself was much more than we could ask for and immaculately clean. It was well stocked with everything you might need and what you don't even know you might need; sewing kit, mosquito repellent, UK to European adapters and USB plug adapters to name a couple of items. The food parcel in the kitchen was a nice touch before we visited one of the many supermarkets in the vicinity. The villa is in a very quiet location but is still under 5 minutes drive from the village, restaurants and beaches and across the road from a golf course. Another visit to Carvoeiro and Casa das Flores is a must. Many thanks. This was the second time we’ve stayed at Casa das Flores and we’re generally reluctant to return to places as we find that return visits can often disappoint. Definitely not so in this case! The house, furnishings, décor, surroundings and, above all, the pool were all as good as, if not better than, we’d remembered! We were two families and the house worked very well with the children in the “east wing” with the large family bathroom and the adults with the two en-suite bedrooms. We would thoroughly recommend Casa das Flores for a relaxing family holiday! We’d also suggest that you pay the owners direct as they are completely trustworthy and it will save you the substantial fees that HomeAway will otherwise charge you. Thank you for your kind review. It's good to know that we continue to get things right! Fantastic pool and BBQ areas. I honestly cannot say anything negative about this villa! There are plenty of restaurants, supermarkets etc nearby and the local beaches are stunning especially the Marina beach which is short drive away but well worth it! Fantastic Villa - 1st Class! This was our first ever villa holiday and it was fantastic! Gareth was brilliant in answering any questions we had before our arrival and everything so was so well organised. The villa was beautifully clean, as was the pool. We spent many hours along with my niece and nephew playing in the pool. Gareth & Jane really have thought of everything. I can honestly say the villa surpassed all our expectations and I wouldn't hesitate in recommending it. Thank you Gareth & Jane for making our time so enjoyable and we hope to be staying again with you soon. Casa das Flores is situated in the quiet residential area of Vale de Milho (valley of corn) overlooking the 1st green of the Vale de Milho golf course, approximately a mile and a half east of the popular former fishing village of Carvoeiro. It is a little over half a mile to the nearest beach, Centeanes, and about the same distance to the closest supermarket at Rocha Brava. Golf: The Algarve is a golfers paradise and Carvoeiro has more than its fair share of interesting courses. Casa das Flores overlooks the first green of the 9-hole, par-3 Vale de Milho course whilst the famous nearby complex at Penina offers three courses designed by Sir Henry Cotton: the 18 hole Championship, the double 9 Resort and the 9 hole Academy. Other nearby courses include Alto Golf, Vale da Pinta, Gramacho and Morgado (opened in 2003). The Vale de Milho clubhouse, two hundred yards from the villa, offers an especially good English breakfast!